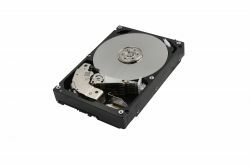 The MG06ACA Enterprise Capacity HDD models provides up to 10TB of capacity and 7,200 rpm performance, in a robust design engineered for nearline business-critical workloads. The MG06ACA model generation utilizes industry-standard 3.5-inch 26.1 mm height form factor and Advanced Format sector technologies for optimum capacity and data reliability. Models support Toshiba Persistent Write Cache technology which helps enhance performance while assuring the consistency of write operations in the event of a sudden loss of power. Equipped with SATA 6.0 Gbit/s interface, the Enterprise Capacity MG06ACA models help to save rack space and reduce the footprint and operational burden of business critical servers and storage systems. The MG06ACA Series improves sustained transfer rate performance to 237 MiB/s and increases MTTF by 25% when compared to the prior MG05ACA series. 4Kn or 512e Advanced Format Sector Technology models are available. 4Kn sector models (MG06ACAxxxA) offer suitable performance and compatibility with the 4Kn-capable applications and operating environments. 512e sector models (MG06ACAxxxE) provide support for legacy applications and operating environments that require 512 byte sector lengths.